When my eldest was quite little she said one day that she didn’t want to see a movie. “It starts happy, there will be a sad bit, then the exciting bit and then the end. Why does there have to be a sad bit?” What this naive but insightful child had done was beautifully encapsulate the shape of a story. 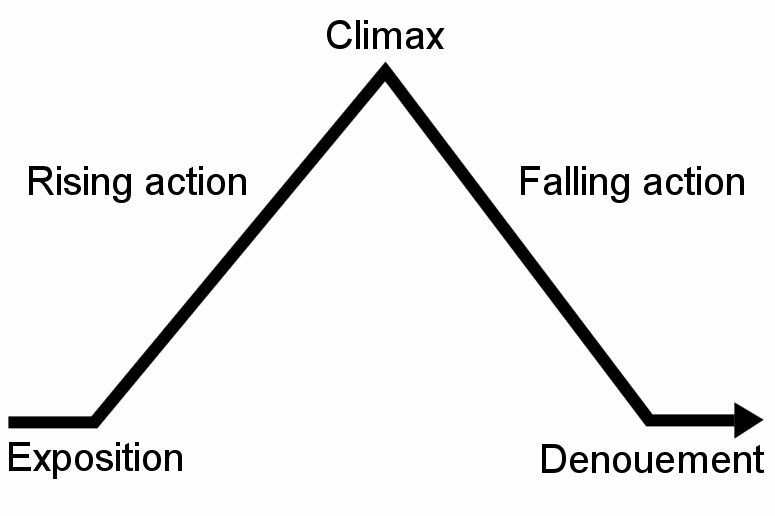 Nancy Duarte in her book Resonate, on her blog and in TEDx talks has described this as the arc of a story. She herself gives credit to Gustav Freytag, a German dramatist who was attempting to understand the structure of Greek and Shakespearian plays and first drew the shape. This is what engages the audience, emotionally. Or not, as my daughter suggested. If you look, you can see that this is what makes a story, a joke, a book, a presentation, or a film work. The initial premise is set out, the problem or context established and the audience is then led through to the end of the story. What makes a great story is the shape, the nature of that journey, and whether we want to go on that journey with the speaker. Too often presentations are simply given that are almost entirely flat. There is no drama, there is no emotion, there is no engagement. Whilst one can understand the drama of attempting to overcome an evil Empire or two star crossed lovers, some, particularly “academics”, might suggest there is nothing to get excited about in say “Comparison of Operative Techniques for Hirschsprung Disease” or “4th Quarter Business Plans.” Isn’t that the problem? If neither the information nor the transfer of that is of value to you, you won’t get excited about and consequently the audience will care little. If you do have an opinion, share it. If you are excited about the future, share it. Otherwise the audience will still be in the same place at the end of the presentation as they were are the beginning. It is their choice to change but your opportunity to influence that change. The challenge to anyone constructing a presentation is to start off analogue (that’s with the computer shut and using a pencil, paper and probably Post-it Notes) and consider your audience. Where are they currently and where do you want them to be at the end of your presentation? Then sketch out the shape, the drama, the engagement, the arc of your story as my friend @GrangerKate has done here.